How to use events to drive data capture. Our client, a Southeast sporting goods chain was looking for ways to drive sales of new merchandise for two popular local sports teams. Their objective was to use sms to drive engagement, capture data and drive sales with a strong segmentation strategy. 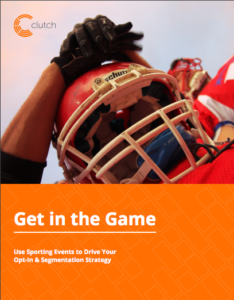 The retailer used Clutch’s mobile solution to identify, understand and motivate customers at game time. Ready for a Mobile Strategy? See how far mobile marketing can take your business. Half of Your Loyalty Program Members Will Forget You Exist.